Finally, I’m getting around to this… I bet becuase I’ve waited two weeks since these events actually happened, the recollection will be a little off. Instead of trying to do a play-by-play for the day, I’m just going to mention what I remember in no particular order. Apollo Sunshine. Managed to see this band twice (once performing, the other at said afterparty…) that day completely by accident. A nice surprise. I’d only just heard the name before that day, now I’m starting to recognize their music. Tyler Ramsey. Acoustic set on a rooftop patio somewhere. He played with a drummer, really hush indie-folk, country blues sort of sound. Silent Years had a decent set, but again, didn’t translate the way I thought it would from the record. Field Music. I watched you guys from the alley way. Next time I’ll arrive earlier…. Wintersleep. I watched you guys from above, on the 7th and 8th stair leading to the roof. Can’t wait to hear your new record (although I think I know it pretty well from your live shows by now). 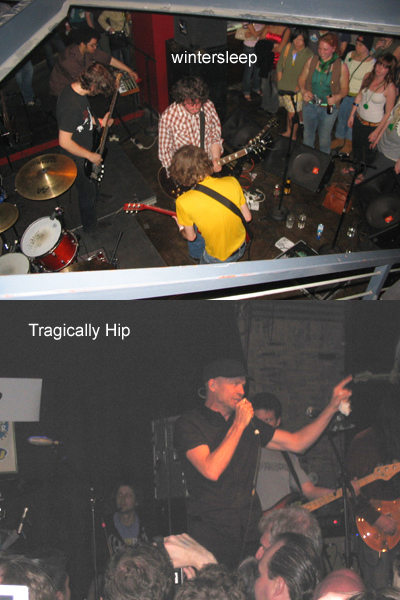 The Tragically Hip. I had to go see you guys. Its in my blood, and I’ll never be able to see you in a medium sized room that wasn’t even packed….